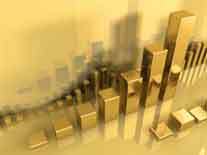 Trading gold – better than Forex? I can’t think of a more boring investment than gold. Don’t get me wrong, the ‘ultimate safe haven’ is a vital part of any balanced portfolio. In times of crisis, gold is the place to be for the serious investor. But if you are looking for big gains from buying and holding onto the yellow metal, you’re going to have a long wait. Yes, the price of gold has increased over the past few years, but that was after decades in the doldrums. And unless you have a serious chunk of money invested it isn’t going to generate any serious short-term returns. (By the way, if you are interested in owning physical gold, and have significant capital to invest, then I can recommend Bullionvault – http://gold.bullionvault.co.uk). Wouldn’t it be great if you could actually trade gold like Forex? Normally I wouldn’t even think of gold as a way to make a short term profits. But something happened recently that has changed my mind. In fact, if things turn out the way I expect, there could finally be a way to make regular serious income from spread betting the gold market. Look, I don’t need to tell you just how many financial trading systems are out there. Most focus on Forex, indices and shares. A few might look at commodities. But as far as I can tell, there are only a handful that look at gold . . . and most of them are based in the US. I had a gut feeling that there must be a way to make money from spread betting gold, especially as it is such a well-established market. Also, all the major spread betting companies allow you to trade gold. And so, I put this challenge to Roxanne Cross. Now you have probably heard of Roxanne before. I have worked closely with her on a series of trading training seminars over the past year or so. She is a brilliant trader and tough trainer (just what you need!). Seriously, if I was to put my trust in anyone to train others in the skills needed to make money trading, it would be her. Always up for a challenge, Roxy went away and started looking at the Gold market. To be honest, I think she didn’t hold out much hope. She’s usually far more interested in the fast moving Forex market and major indices like the DOW, DAX and FTSE. But when she came back to me, she had good news . . .
My hunch was right. Roxy confirmed that there were plenty of opportunities every day to make money on gold. Even better, when gold establishes a trend it usually sticks to it. As the market does not suffer from the high volatility of Forex, it means that it doesn’t whipsaw and trigger your stop loss. OK, trading gold may not have the white-knuckle excitement of Forex, but then if you are making regular winning trades who cares! And when you realise that you can trade pretty much at times that suit you, and don’t have to be stuck to the screen all day, then you can see how attractive it could be. Early indications show that you could be making as much as 30 – 40 points a day from trades! And so Roxy and I decided to develop a trading programme focused exclusively on gold. This would take the form of a manual and CDs and all-important support and ongoing training. And it’s this latter aspect that Roxy insists upon. As a trading trainer she believes passionately in giving ongoing guidance to her students and it will be no different with Gold Buster. Although I have total trust in Roxy’s ability to develop winning strategies that work over the short and long term, I wouldn’t be doing my due diligence if I didn’t put it to the test before going on general release. So we are now seeking Beta testers for the Gold Buster strategy. If you would like to put your name forward and also get the latest news on this exciting new service, then just go to the following link. Oh yes, as an added bonus, if you register on this list then you can also get a discount if/when Gold Buster is released. If you want to find a way to make money from this ‘boring metal’, then I urge you to sign up today.